In the wilderness of the Northwoods flows the Moose River. The Moose River is seldom visited when there is not snow to travel on as much of it is hard to access. Wolves and bears travel along the river’s edge in search of food while beavers cut the alder and willow along its banks to build lodges and dams. The river varies widely in its character, contour, and speed. Much of the river meanders through large marshy flats which waterfowl use extensively in the fall when heading south for winter. In other sections, the river narrows and is funneled through rock chutes or ‘gorges’ sending the water rollicking downstream. After snow melt or heavy rain, these gorges are roaring with the echo of rushing water. 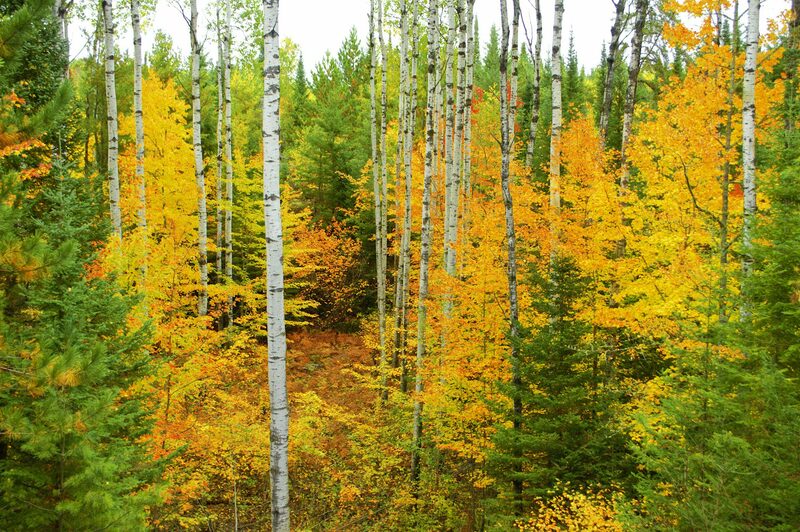 In the fall, the vivid colors of the birch, aspen and maple interspersed among the conifers create a beautiful scene. One day this fall, I was fortunate enough to hike a large rock ridge just on the edge of the Moose River. The gorge was roaring, the colors flaming, and I even spotted a few spruce grouse. Tom, this was a really great post! Loved your descriptions of the Moose River. Your words really painted it beautifully! The photos? Absolutely, fantastic! Thanks so much for visiting my blog and following! I look forward to your new posts too! That close-up of the birds in the tree is amazing. I want to set it as my wallpaper. Are they grouse? Thank you for your like of my post “Willow Madness” and for the follow. So glad it brought me to your blog. Enjoyed your “Moose River” post – beautiful pics- and am signing on to follow. Beautiful, just the kind of place I like to be too. Very lovely pictures that make me feel like I am there. Love the fall colors and the descriptions of the river. I have never seen spruce grouse before so thank you for sharing this. This is the type of area that I would definitely love to hike and spend time at. Beautiful textures and colors in your photos. Lovely birds. It must be wonderful to hike in the splendors of the natural world. I like to visit vicariously. These photos are lovely — so saturated with color and texture…I almost feel as though I can hear the wind in the trees and the water’s voice. And I absolutely adore the Spruce Grouse! It must have taken a good eye to find them, given their how their coloration mimics the surrounding foliage and shadow. Thank you for sharing. Fantastic images of what sounds like a wonderful wilderness. The Grouse shots are amazing. Really good work, TOM. Catching Grouse roosting is pretty special. Beautiful river scenes! I am physically impaired and therefore unable to walk in your God country. Fortunately, I can read excellent posts like yours and dream. Oh, your photos are magical! Thank you for transporting me to an earthly paradise! Gorgeous photos, Tom; love the grouse! Lovely birds and river views. Wonderful scenes to start out the day. Thank you!